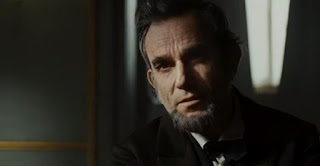 The comparison has already been made but indeed Lincoln plays a historical episode of The West Wing, a modest affair considering the canvas of American history at Mr. Spielberg's disposal. By the story of Lincoln, admirably is confined to the two month period or so in which he sought to pass the 13th Amendment, abolishing slavery, with most of the conflict involving the political dealings it took to secure the two thirds House vote. With Spielberg histrionics kept in check, the only misstep is the needlessly long running time, and at times overly verbose Tony Kushner dialogue. In the film's only battle scene The bloody Gettysburg battle Spielberg, in the opening establishes the sickening brutality of the Civil War, bayonets piercing bodies and boots stomping soldiers' facing the mud are startlingly present and real. We don't even get to hear the Gettysburg Address, instead retold in parts by a couple of resonant soldiers meeting Lincoln after the battle. The effect of the black soldiers in the battle in part causes Lincoln to, once again pursue, the passing of his emancipation amendment. It seems this decision to only barely show the battle and not show the address signals his modus operandi, playing against his own expectations and constraining himself with Hitchcock like confines. Of course this is nothing like a Hitchcock film but knowing Spielberg's reverence for the man we can't help but think he was influenced by Hitchcock's periodic experimentation and desire to challenge himself with creative restraints. Even the performance of Daniel Day-Lewis is restrained. His Lincoln comes off as humbly heroic, also conflicted, quiet and beleaguered, but still supremely confident. The supporting actors such as David Straitharn match Day-Lewis admirably. Tommy Lee Jones is receiving more praise than he should, the most memorable characters perhaps are the comic trio of James Spader, John Hawkes and Tim Blake Nelson who exercise the task of attracting the votes of the undecided members. Tony Kushner's script, written with the intellectual detail of a stage play, feels like it was constructed in two halves, the first extremely loquacious, with much of the background and character introductions set up up with wordy dialogue and the second which plays out the final frantic moments of the House voting with a different kind of simplicity and directness. One of the most fascination complications in the affair is the choice Lincoln to pursue the amendment, a decision which might just further the war. With the southern states seceded, they don't get to vote in the House, thus making it easier to pass, but at the same time alienating peace talks. Spielberg and Kushner makes this clear, a choice which is beyond right or wrong notion of the slavery, and an example of the nuanced complexity of the story.